Extremely easy to apply. Even first time users can expect perfect results. Absolutely will not overlap, run or leave drip marks. Dives deep to replenish old dry wood. Loaded with transoxide pigments providing much better coverage than other paraffinic stains. Ideal for annual maintenance coats. FREE SHIPPING on every 5 Gallon pail! If you have ever worked with paraffinic based wood stains, The Woodrich Brand Timber Oil will have a familiar ease of use. No matter what application method you choose, it is impossible to cause any lap marks or runs. Even Homeowners who have never worked with wood at all can achieve a beautiful finish their very first try with this easy to use product. Building a new house in Va. (Roanoke area) with cedar shakes at the gable end on the front of house. Want something transparent to semi-transparent in a darker brown color. Recommendations? 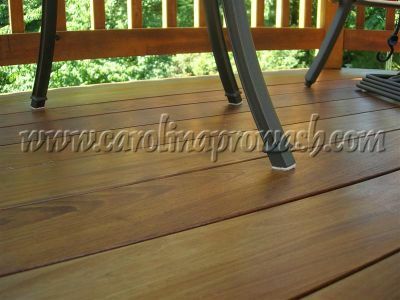 Look at Dark Walnut in the Restore A Deck wood stain. I live in northern Ohio, and had a pressurized deck built last August. I understand I should use the Restore-A-Deck Cleaner, and Brightener. 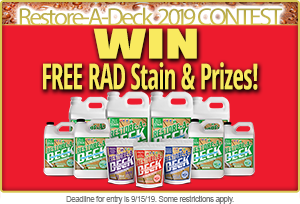 Which stain would be best for the deck as well as nourish the wood, the Restore A Deck Stain, that can be applied when wet, or the Timber Oil? If the Timber Oil, how long does it need to dry before it rain? Use the RAD wood stain. Meant to say damp wood. Hello, no it cannot. Must be dry for 48 hours. I purchased the brown sugar. It's just too yellow. If I were to purchase amaretto to do a second coat what would you expect the outcome to be? Amaretto is reddish in color and it would be best to not do it right now but in a few months. Can this be applied to camp wood. Just finished cleaning and brightening my deck and then it rained. It's sunny and warm here this morning and would like to start staining of possible. Hi! We rebuilt our deck last year over a four month period using pressure treated pine. Letting the wood age was a challenge as it did so at separate times as well. It has been aging since August and would like to begin. Can you give me a good idea where to start. How to clean and prep for staining and which type of stain would work best. We are in southwestern PA and prefer a transparent/semi transparent. We made many mistakes with our last deck including using Behr stain??. We had to tear it down. For staining, best to use a good penetrating stain like the Woodrich Timber Oil or the Restore A Deck Wood Stain. This makes reapplication much easier. Really appreciate your response! We are tired of dealing with junk products & stain. We will likely need a 5 gallon package!! Can Timber Oil brand be used on new pressure treated wood? 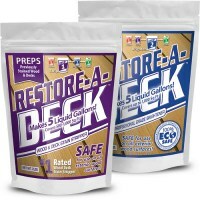 Yes, but you should let it dry for a month and prep first with the Restore A Deck Kits. Make sure to only apply 1 coat when staining new wood. We have large rough cedar posts on our front porch can this be used on them? Which is better for a new cedar deck? wood rich timber oil or semi transparent stain? Some of the deck is 5-6 months old and some like stairs and railings only a month old. Also, which is easier to maintain when re doing in 2 yrs with the restore a deck cleaner and brightener. The Timber Oil would work well and is a semi-transparent. Stay with same if you like in 2 years. I just built a new deck using Lowes Pro Choice decking for the floor.Less than 3 weeks old I am already noticing the grain is already lifting in areas. I have been looking @ your product ( Woodrich Timber Oil) , and was reading where it was good for new decking. Is there a retail store that this product can be purchased from or is this strictly online only? How many square foot would a gallon cover. Floor of deck not including railing. 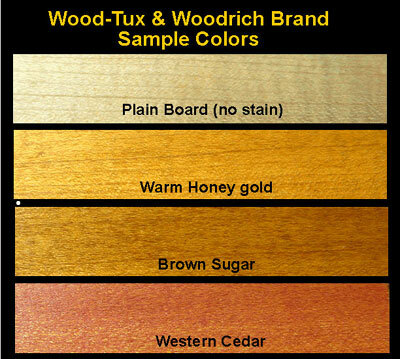 What is the difference between Woodrich Timberoil and Woodrich Hardwood Stains? I am intersted is finishing a cedar deck. Which of these products is best suited for cedar? Thanks. No the TimberOil only comes in transparent but tinted colors. Does the Woodrich Timber Oil come colorless? I do not wish to stain my decks, only preserve the wood.